"If nobody wants to make Windows phones, we will make them ourselves." This doesn't really sound like pep talk from Microsoft's CEO Satya Nadella, but that's exactly what he said in an interview not long ago. And make they did, skipping a flagship Lumia generation, and going from the current Lumia 930 straight to the Lumia 950 and Lumia 950 XL as titles for its upcoming top-shelf Windows 10 Mobile gear. With this name switcheroo, we are looking at a Lumia 950 with a 5.2-inch screen with a resolution of 1080 x 1920. That works out to a 424ppi pixel density. A Snapdragon 808 is under the hood with a hexagon CPU and the Adreno 418 GPU handling graphics. 3GB of RAM is inside along with 32GB of internal-expandable storage. 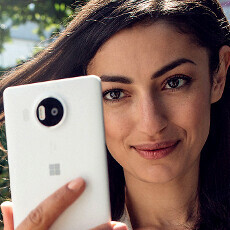 A 20MP PureView camera adorns the back while a 5MP front-facing snapper handles selfies and video chats. A triple LED flash allows you to take well-lit pictures in low-light conditions. The Microsoft Lumia 950XL in its turn features a 5.7-inch glass with a 1440 x 2560 resolution. That gives the screen a 515ppi pixel density. The 64-bit Snapdragon 810 chipset drives the phone, carrying an octa-core CPU and the Adreno 430 GPU. 3GB of RAM is inside along with 32GB of native expandable storage. Like the Lumia 950, the camera on the 950 XL is said to come with a 20 MP PureView snapper on the back, and a 5MP camera on the front. Both phones are expected to arrive soon, carrying the new Windows 10 Mobile out of the box. Check out how the two new Lumias look in these official images. great or bad aside. How come PA mentioned 1080p display with 424ppi for 950? Microsoft is stating Qhd display with 564ppi. Even, PA mentioned in its own previous news that 950 has QHD with 564ppi. What is this Denial? plz explain. what is with 5th gen OIS what things it brings or its just a marketing name ? it's the fifth generation of improvements for the stabilization mechanizm. basically it's the best optical image stabilization you can buy. ok improvements ? may be ois will behave more smoother so less to no jelly effect... what I remember is 1 gen had 2 axis OIS second gen had 3axis, so in this nothing like major improvements I guess. but will wait and see I will wait for the video sample to see if this reduce or removes the jello effect in the video Because lumia or OIS phones do give jello effect while recording.